Everything that could have been done wrong, was done wrong. Every bias that could have been manifested, was manifested. Every fallacy pertinent to the matter at hand was made. The conclusions, regurgitated from unnecessarily complicated statistical procedures, did not follow from the evidence gathered, which itself was suspect. In its way, then, the paper is a jewel, a gift to the future, a fundamental text to how easy it is to fool oneself. Consider that its errors are not far to seek. Take the opening sentence: “Although nearly all domain experts agree that human CO2 emissions are altering the world’s climate, segments of the public remain unconvinced by the scientific evidence.” Isn’t that gorgeous? I count at least seven mistakes, and we are only at the very beginning! Mistake 5: He confuses physics with economics, a vulgar but common error. It may be true that, say, temperatures will rise by 0.5o C in the next five decades, but it does not follow that any theory of what will happen because of this temperature rise is true, nor is it true that anybody’s suggestion to combat the adverse consequences of what will happen is therefore worthy of consideration. Mistake 6: Since Lewandowsky committed this howler, and is obviously unaware of it, he cannot see it in the people he interviews, who often make a similar error. That is, when a civilian is asked, “Do you believe in climate change?” he often answers “No,” but the mistake is to assume he is answering the question as stated, when in reality he has answered the modified question, “Do you believe in climate change and should the government regulate, rule, tax, control, mandate, penalize, etc., etc. to combat this change?” Such an elementary mistake by a psychologist shows us just how far the madness has progressed. Mistake 7: Lewandowsky, because he is not a domain expert, misunderstood the basic physics. There are no domain experts who do not agree that mankind changes the climate. The only matters in question are: how much? where? when? with what certainty can we know? Notice the absence of “What can be done?” because this requires expertise in human behavior, and that expertise is what is suspiciously missing in this paper. My dears, I emphasize that this was merely the opening sentence, and that much worse was to come. Ah yes but William Briggs is just an ordinary statistician, not a CLIMATE statistician…. 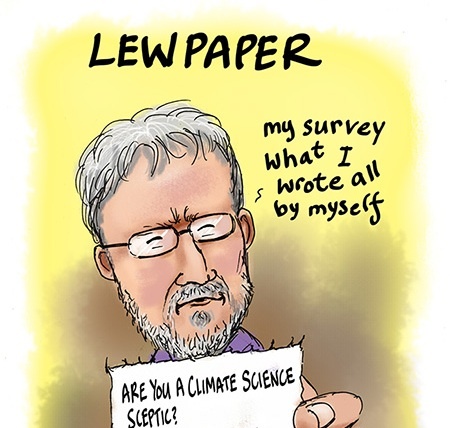 Australian taxpayers are forking out a truck load of money for Lewandowsky’s very bad opinion piece, masquerading as quasi-science!